The holiday season is here! Are you searching for just the right space for an office gathering or party with friends? We’ve got three restaurants – River City Cafe, Nacho Hippo and UCP Game Zone – in the Myrtle Beach area that are perfect for throwing an unforgettable holiday party! Ultimate California Pizza Game Zone is known for their handcrafted pizza, exciting games and the hottest prizes. It’s the spot you go in Myrtle Beach to Eat, Play and Win! So if you’re in search of a one stop party spot – look no further than UCP Game Zone. We have a private room in the restaurant that can be reserved for parties. This area not only has plenty of seating, but has a buffet and drink serving station so your guests can get their fill of ‘Best of the Beach’ pizza. After everyone is full – you can all head into our gaming area where you can battle it out in air hockey, test your aim in a Water Gun race, bowl strikes and shoot hoops. 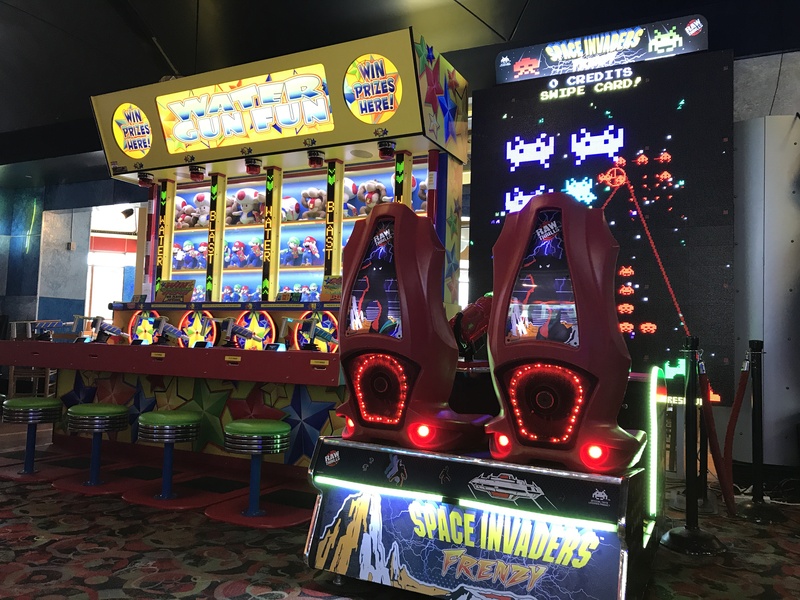 UCP Game Zone has classic games like skee ball and Space Invaders as well as new interactive games like Jurassic Park and Walking Dead. There’s even a Spin Zone, which is known to cause continuous laughter as you and your friends spin and bump into one another in giant bumper cars. After you’ve had enough game time, cash in your virtual tickets at our Prize Center. You can pick out prizes like basketballs, pool floats, mini pinball machines and more! UCP Game Zone is fun for all ages and is a great spot to host a holiday party for the kids, co-workers and families! Are you in search of an oceanfront party spot? Look no further than River City Cafe in Surfside Beach, which is located right on the ocean! Our third floor has a beachy vibe and was designed with a party in mind. There’s a large, fully stocked bar smack dab in the middle of the room, so getting a refill on a cold cocktail is never a problem for your guests. We have a state of the art kitchen conveniently located on that floor that ensures your food will be served in a timely fashion regardless of how busy the rest of the restaurant is. When it comes to catering – we love getting creative in the kitchen and can help you craft just the right menu for your party. The room itself contains eclectic and unique decor, from out infamous license plates to a giant wooden giraffe head. There are colorful tables spaced around the room that can be arranged however you’d like to accommodate any seating for any size group. And best of all – the view! There are giant windows so you can mix and mingle with guests while everyone enjoys breathtaking views of the sparkling Atlantic Ocean. If you’re looking for a fun spot to party by the ocean – with no room rental fee to reserve the space – River City Cafe in Surfside is the place for you! If you’re throwing a holiday fiesta – check out Nacho Hippo in The Market Common. We’ve got a whole room dedicated to large parties and can accommodate any size party group. The room itself can seat up to 100 people with tables and booths. There’s plenty of space to rearrange the tables however you’d like. Our party room has its own full service bar, so your guests won’t have to go far for a ‘Best of the Beach’ margarita. We have plenty of delicious menu items to select from and can help you create a menu that the whole group will love. We can even put together a ‘Best of the Beach’ nacho bar complete with our homemade tortilla chips and homemade dips that we serve in margarita glasses … because who doesn’t love queso?! And when you reserve this party space, you don’t have to worry about taking any money away from those holiday gifts because there’s no room rental fee. So if you’re trying to throw a giant, festive holiday party with a cantina-style twist – Nacho Hippo is your go-to spot! As you can see we know a thing or two about hosting a fun party and offer a variety of options around Myrtle Beach to choose from depending on the style of holiday party you’re trying to throw! And the best part about any of our party spaces is the fact there are no room rental fees. If you’re ready to start planning – give us a call today to reserve your space to throw the most unforgettable holiday party of the year!